This excerpt from the newly released Amar Chitra Katha comic book "Saptarshi" tells a story I hadn't heard before. In this account, the sage Vishwamitra visits the ashram of the sage Vasishta, who is telling his shishyas about how Japa or repeating the holy names bestows the greatest power on a person. But Vishwamitra disputes this, saying that Dhyana or meditation bestows the greatest power. To resolve their disagreement, Vishwamitra and Vasishta go to Vishnu, but he's busy and leaves his serpent Adiseshan to settle it. Adiseshan says it is difficult for him to think while he is supporting the Earth on his hoods. So Vishwamitra offers to hold the Earth for him, using the power of meditation to give himself strength. But he's not able to hold it on his head for even a minute, so Adiseshan gives it to Vasishta. Vasishta chants Vishnu's name, and is thereby able to hold it on his head. And so Vishwamitra finally concedes that Japa is more powerful than Dhyana. My question is, is there any scriptural basis for this story? Amar Chitra Katha comic books are sometimes based on scripture and sometimes based on folklore, so I'd like to find out which it is in this case. The only other Rishi I know of who carried the Earth was the sage Kashyapa, who did it twice as discussed in my answers here and here. 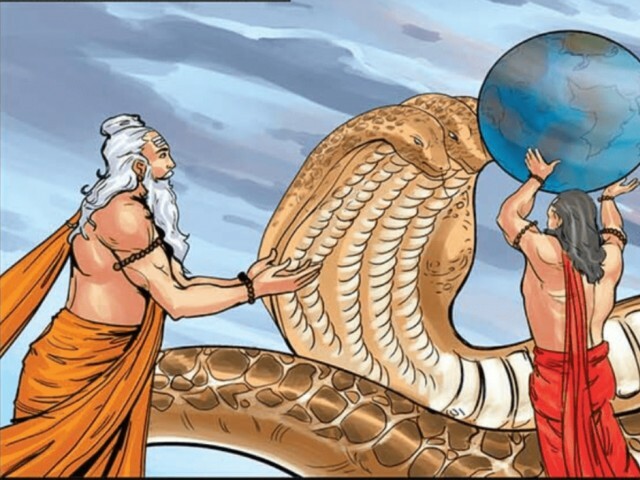 On a side note, assuming the story is true, Vishwamitra and Vasishtha presumably used Mahima Siddhi or the power of becoming large to get big enough to hold the Earth. Browse other questions tagged mythology vashishta earth adisesha vishwamitra .